Shrimp is definitely a one of kind seafood. It has captured a lot of hearts of almost every household in the U.S. No wonder that there are a variety of shrimp recipes around waiting for you to follow. It would be much better to cook fresh from the sea and raw shrimps and right to the pot. However, if you are not living near the coastal areas, frozen shrimps in the grocery stores will do. However, there is a slight different between the fresh and frozen shrimps when it comes to the flavour and taste but nevertheless, a shrimp is still a shrimp. 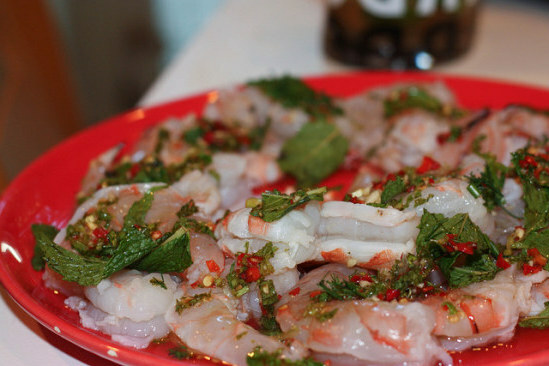 Here is a simple recipe in cooking raw shrimps. Before you even attempt to cook the shrimp, you must devein the raw shrimps. It is advisable to cook the raw shrimps while they are still in their shells. Since it will be the shells that will protect the meat of the shrimp plus it gives more flavour to the shrimps too. In order to properly cook 1 pound of raw shrimps, you must prepare at least 2 quarts of boiling water. Then, slowly add a dash of salt water to the boiling water with the raw shrimps inside the large pot as it slowly cooks. If you fancy adding a little bit flavour to the shrimps, add a squeeze of lemon juice. Turn off the heat of the stove and slowly pour the shrimps all at once into the water. Let them sit at a room temperature for about 3-5 minutes or until the shrimps are all done. Raw shrimps taste yummy when they are cook on a gentle process. Do not even leave the shrimps unattended. This might lead to overcooking the shrimps and the flesh will be tough and slowly they will lose that delicious salty flavour. In order to check whether the shrimps are all cooked or not, get one piece of shrimp and cut it into half. If the colour of the entire flesh of the shrimp is all opaque, then it is a sign that all shrimps are all done. Remove the shrimps out of the water right away. Put on a platter and garnish. If you want, you can add a side dish to it or a dipping sauce.